From China to the USA – Teaching Each Day! When it comes to writing in science, sometimes my students get confused or don’t know where to begin. I like to give them a tool to use in the beginning to help them form sentences. It is a simple page with sentence starters to help them form good/complete sentences. I introduce them to the starters and explain some of the terminologies. I then give them some simple practice questions to try. As the year progresses this is a tool they can use whenever we have a written assignment. It is nice because I don’t have to constantly formulate ideas and I can point them back to this as a tool. What tools do you use for writing in science? 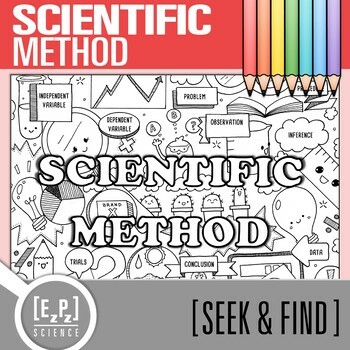 Earlier in the year as I was looking on TeachersPayTeachers for scientific method resources, I came across EzPz-Science. She has some really cute stuff that later I found my self coming back to again and again. On her main page she says that her goal is to increase student engagement with fun and creative lessons for middle school science. I personally think she is doing a phenomenal job. The first resource that I ever used from her was a seek and find. It is a picture that contains key vocabulary words. Read more about them here in a blog post by EzPz Science! Whenever I first present the idea of creating questions to students they are most of the time apprehensive. We go over the question words (who, what, when, where, why and how). We also talk about what makes a good question. I also provide them with the following tool – Discussion Question Stems. Feel free to print it to use with your students! I love having a scientific conversation in my room. However, I want to hold everyone accountable and contribute to the discussion. As I was researching ways to hold students accountable I came across an awesome Kagan Strategy called Talking chips. So basically you give students discussion chips and each time they talk they place their chip in the middle. If they run out then they have to wait until everyone has run out of chips. This works great for small groups and with the correct set up the entire class. I usually set a specific topic of discussion. Then, I use poker chips as discussion chips, but any math manipulative would work. How do you regulate discussion in your classroom? When I taught ELA, I used Socratic seminar a lot. It was a way to have student-generated discussions and it was something that I learned during student teaching. In this post, I am going to give you some information and tips for using this in science class! It is a method of discussion inspired by Socrates. Socrates believed in order to teach people you would not give them answers. Rather you would ask questions and help them arrive at answers on their own. For ELA I had students prepare questions and evidence for something that we had read. This is a viable option for Science as well, however, I think it could also work to discuss a phenomenon or an experiment completed in class. This is where science Socratic seminar would be different. It would not be entirely literary based. Before you try to implement a Socratic seminar, I think it would be very important to explain what evidence is in science. I have found this is the most tricky part for my students. I would also go over the following guidelines and explicitly explain what will happen and how things will work. 1. Come prepared having read the required reading or completed the activity for discussion, and with some questions or topics to discuss. 2. Be an active listener and speaker. Contribute to the discussion. 3. One Voice – only one person can speak at one time. 4. Be respectful (even if you do not agree). 5. Use evidence or examples from your reading or activity. 6. Explain your answers – a simple yes or no is not acceptable you must explain. As a teacher, you will simply be a facilitator of the discussion. Students will be expected to generate the discussion. I usually have a checklist ready and I explain to my students that they must contribute to the discussion a set number of times. Then I just check off when they contribute. I am excited to try this in my classes and I hope you will try it too. Below is a resource to help you further (I created it for ELA teachers, but I think it is helpful for science too). I don’t know about you, but April always seems to be a crazy month. It is filled with Spring Break, Prep for Testing, Testing and a plethora of other events. We are getting close to the end of the year, but school is not over. Sometimes it is hard to keep my students in that mindset! I like to change things up at this time and I am sure to add interactive activities. Here are a couple of the ideas coming up in my classroom to try and avoid spring fever! TASK CARD Egg Hunt: Basically regular task cards hidden in eggs around the room! Brain Breaks – to break up the monotony! We use dance breaks with baby shark and the cha cha slide. We also play quick games shake it out and Gorilla, Man, Gun! What kinds of activities do you do to avoid spring fever? So I took the week off last week to relax and spend time with my Family. On Saturday, I got to scrapbook with my sister Lindsey. Then, on Sunday we went to stay with my husbands Memaw so that we could purchase the Atlanta City Pass. Monday we visited the World of Coke and my daughter was enthralled with the Coca-Cola Polar Bear! Wednesday we met up with my Father-in-Law and headed to the Zoo. The favorite of the day was the Gorillas. My daughter did not want to leave their enclosure! We also rode the zoo train and the Carousel four times (My daughter rode a crane, panda, pig and a horse). Thursday we were able to attend Fernbank. We got to do several interactive exhibits where we flew like pterosaurs, became meteorologists on the news and explored underground caves. My daughters favorite was the outdoor area and the playground. We ended the day with a 3-D movie about Pterosaurs (my daughter fell asleep). Friday we hung out at our house and had Indian Food. Saturday we headed to the Lake and celebrated my Mom’s Birthday. This included my daughter jumping in the water and urging me to come in too! On Sunday – the first day I even looked at stuff for school – we tried to relax and get ready to head back to work. What a whirlwind of Fun! I feel kinda like I need a break from break, but it was all worth it.